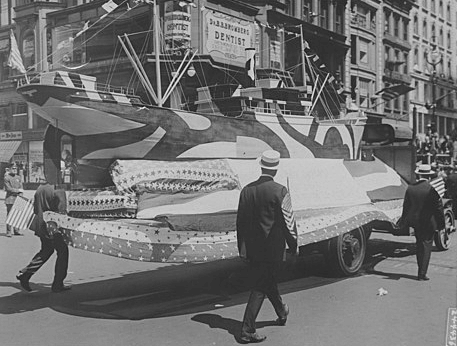 I was all set to get working on the best and worst of June 1918—belatedly, due to my ruminations on reaching the midpoint of this project—when they had a humongous 4th of July parade in New York. Change of plan! June was a slow month for bests and worsts anyway, so I’ll roll it into July. The theme was loyalty—specifically, how loyal all the different nationalities living in our land are to the U.S.A. But a mini-WWI broke out during the planning, with other delegations objecting to the Hungarian historical display, what with Hungary being at war with their nationalities and also with the United States. So a deal was struck: Hungarian historical characters out, Hungarian national costumes in. But the Italian Four-Minute Men* objected to the costumes, and the Hungarians said if they couldn’t wear costumes they weren’t coming, and finally the Grand Marshal brokered another deal whereby no one would wear national costumes. Which seems to defeat the purpose of a parade of nationalities. 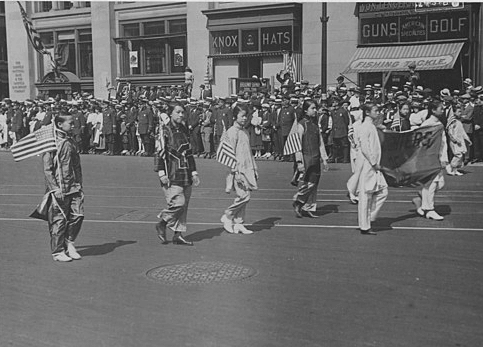 the reflection of European antagonisms did not appear in the parade, and nationalist displays which had been found objectionable when the advance program was made known had been censored to fit the demands of the spirit of the day. Because what expresses the spirit of the Glorious Fourth like censorship? There were political machinations as well. 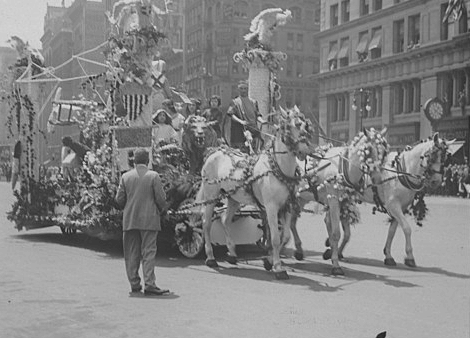 William Randolph Hearst invited practically all of congress—members, the New York Times said, of “both the Republican and Democratic faiths”—to come up from Washington for the parade and other amusements, including the Ziegfeld Follies and a gala dinner at the Astor Hotel. Even though no one cared about conflict of interest, this seemed to be beyond the pale for some, because “a great many declinations were given.” In the end, 33 members of congress showed up. Seven railroad cars from Washington to New York were reserved for “Mr. Hearst’s excursionists,” but that’s not as impressive as it sounds because, the Times said, “it was apparent that many of those who accepted Mr. Hearst’s invitation were women.” But don’t feel too bad for WRH—John Francis Hylan, the Tammany Hall mayor, abandoned the reviewing stand that had been built for him, declared Hearst’s stand the official stand, and decamped there to hang out with him and the congressmen. 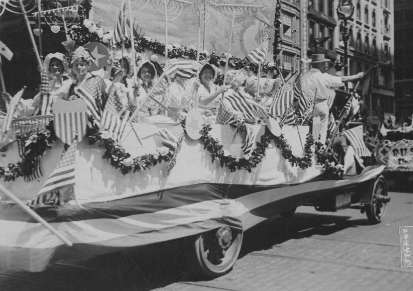 It was more than a pageant, more than a parade; it touched on more than Independence Day; it went further than a mere display of the loyalty of citizens born abroad. 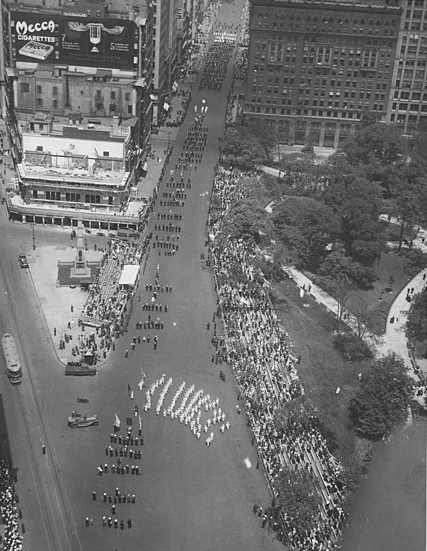 It was more than a military display, more than a picturesque pageant, though those who have seen all of New York’s great parades in recent years said that it surpassed them all in the brilliancy of the color and the variety of figures represented. 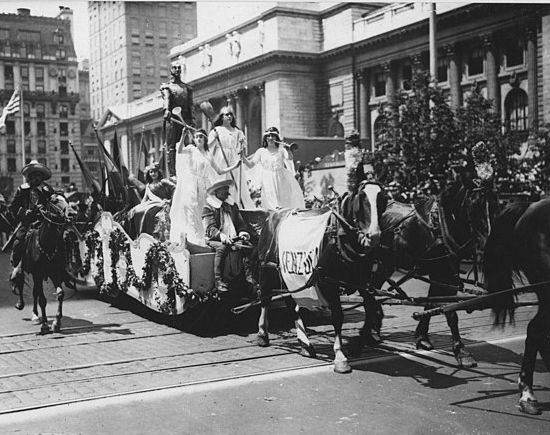 Regarded purely as a pageant, the parade was remarkable in bringing out a greater variety of display of national spirit and national costume than the city has perhaps ever seen before. That’s right, national costumes! Either the organizers backed down or the participants, having worked their fingers to the bone sewing their costumes, just didn’t care what the Hungarians and Italians and Jugoslavs had negotiated among themselves. 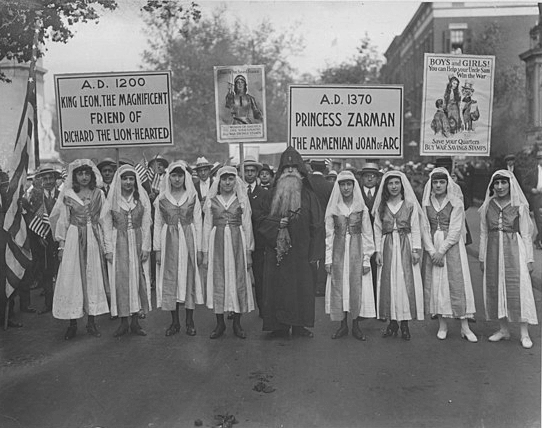 The brilliant pageantry of the Slav races had to some extent been anticipated, but what had not been expected by the public**, at least, was the remarkable exhibitions put forth by Armenia, Syria, Switzerland, Spain, Venezuela, and other nations whose floats and marchers were on a plane of artistic effect that is not often found in a street parade. about twenty-five children of the streets, picked up at the last moment as part of the committee’s Americanization display. Also, the Salvation Army threw donuts out to the crowd. a group of Bulgarians of American origin***—citizens of the blood of the nations of the German were thus indicated instead of simply the name of the nationality, as were Allies and neutrals—came in motor cars. The French delegation wasn’t provided with a military band as promised, and was pissy about it. Huge cheers, though! “Jewish” was considered a nationality, and there was a float with Judah Maccabee’s army fighting for freedom alongside Jewish soldiers in the American army. Palestine, somehow, was represented by Miss Sally Bergman. The Hungarians, after all the hoopla, marched as “ordinary citizens in civilian dress.” IMHO the Hungarians got shafted. 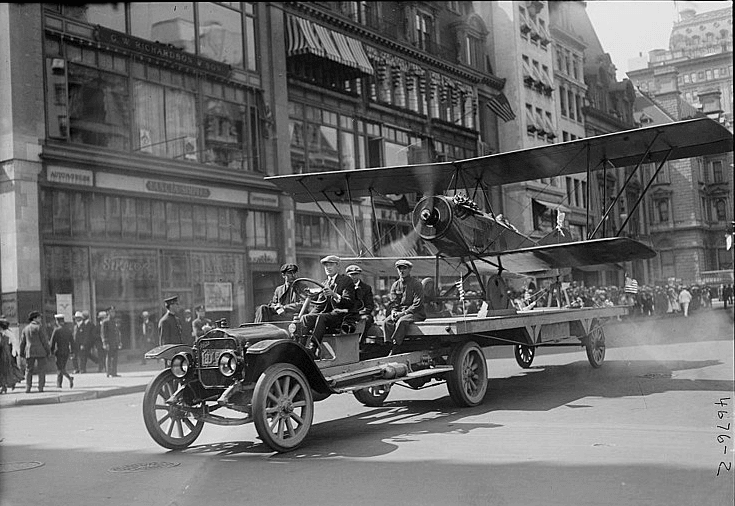 All in all, a remarkable event—although one that may be more fun to read about it would have been to attend. As spectacular as the costumes were, watching Czechoslovaks tramp by for half an hour must have gotten kind of old, no offense to my grandmother, who, if I have my family history right, may have been one of them. And I’m not clear about the bathroom situation. 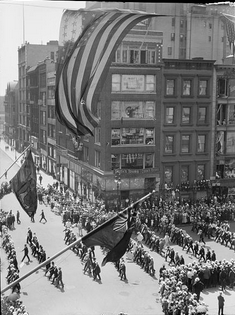 But—good news!—you can watch the parade from the comfort of your own home. It was filmed so that soldiers overseas could watch it. Here’s a six-minute excerpt, followed by two minutes of footage of the celebration in Washington, D.C., which I wasn’t as into until I realized that it features, in the final seconds, All-Woman Battalion of Death Commander Maria Bochkareva, who was in town to plead with President Wilson for help. 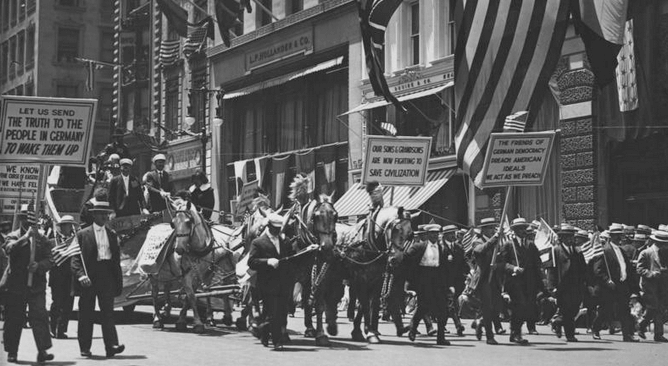 From a 2018 perspective, the idea of having a giant parade around the theme “recent immigrants are not traitors to our country!”—with prizes given for the best loyalty pledge****—sounds a little off. Especially given that, the day after the parade, there was a big roundup of people of German descent who had committed treasonous acts like painting their pencils the wrong color. 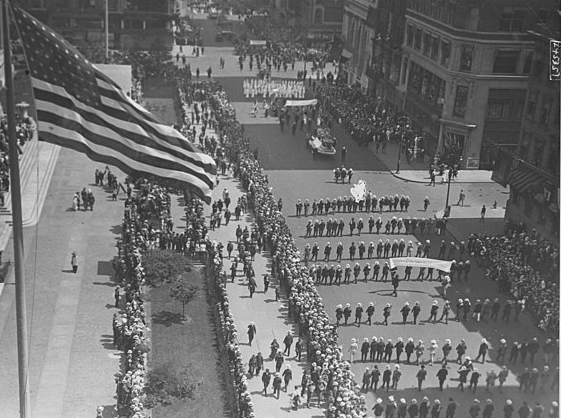 On the other hand, living as we are—and as people in 1918 also were—at a time when immigrants are being used as political punching bags, there’s something refreshing about the spectacle of hundreds of thousands of people celebrating all the different ways there are to be American. *Four-minute men gave four-minute speeches on topics provided to them by the Committee on Public Information. ***“Bulgarians of American origin” seems backwards to me, but whatever. 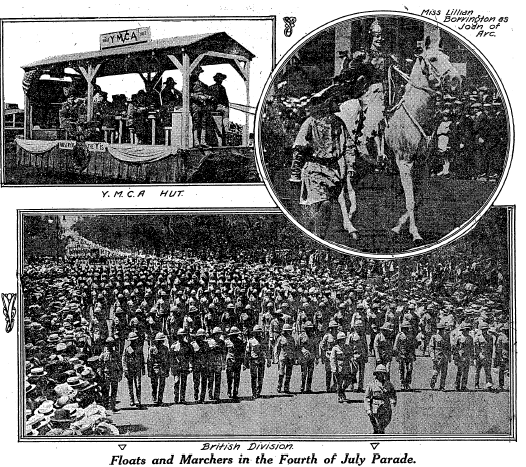 This entry was posted in In the News, World War I and tagged 1918, history, Independence Day, July 4, New York, parades on July 6, 2018 by My Year in 1918.